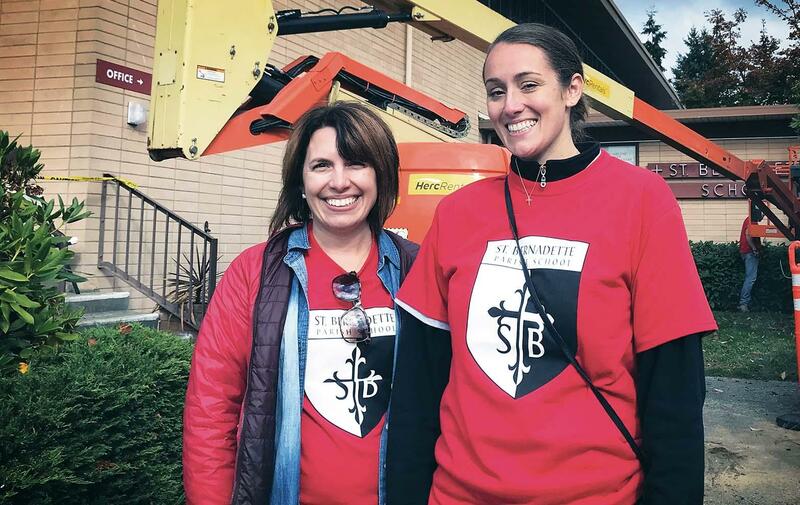 On Saturday, October 6th, over 350 volunteers from NAIOP (the Commercial Real Estate Development Association) arrived early in the morning at St. Bernadette Parish School in Burien to drastically improve the school and surrounding property. Each year for the past 25 years, NAIOP selects one physical community to transform through their Community Enhancement Grant with the help of hundreds of volunteers from the real estate industry. The St. Bernadette community benefited from the service of many hands–work that totaled over $400,000 in value. This year, NAIOP opened the grant application to religious organizations. John Pietromonaco, chair of the project for 2018, called the Fulcrum Foundation to inquire about schools who might be interested in applying for the day of service. St. Bernadette Parish School was selected as the grant recipient last March. “Each year, we seem to get more volunteers from the real estate community that want to give back,” says Pietromonaco. “This year, we received over $70,000 in cash donations and $70,000 in pro bono donations, on top of the labor the day of the event.” Key project areas included the playground and play area, fencing, school entries, and some classrooms, all of which were significantly improved throughout the day of service. Team members from Fulcrum Foundation joined the efforts and were personally moved by the incredible showing from the entire real estate industry. The work completed by NAIOP volunteers on behalf of St. Bernadette will impact the physical structures and spaces that the entire community will rely on for many years to come. Download the entire 2018 winter newsletter here.